HeyPlantMan! Exotic Tropical Plants from St. Pete FL: Happy New Year ! Wow, 2015 has been an eventful year. First of all, we are still here ! Yes, we never take that for granted, that we are still here in sound mind and bodies, that our business continues to flourish...that we are in the middle of a 14th year with our home base of Saturday Morning Market, downtown St. Pete., that this year brought milestones of family doings with marriages & graduations. So much to cherish. And plants ! 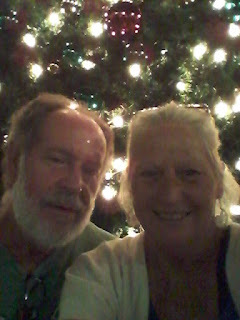 Oh my.....our babies, our life, And customers.....Valued customers old and new that continue to help support us. We love what we do. We love that YOU love what we do ! Just like the old images of the old man coming into town, on a horse drawn carriage, bringing his product, pots and pans clanging against the sides, bringing to people his stuff, that continues to help him survive.....so our carriage might not be horse drawn, but the old truck is hanging in there, and the sounds that you hear? It might be the wheel bearings squeaking, or the panels of the trailer rubbing together...or Lord knows that tiny sound of air escaping from a tire with a screw in it...you can hear of the sounds of the ice thrashing around in our small cooler loaded with water and Gator aid and wet cloths to cool Mitch down...there will be lots of paper thrashing around, from bills and flyers and business cards on the dashboard to the sounds of the plant boxes shifting around bursting with gorgeous foliage that we have carefully packed to bring to market and shows. So, we begin a New Year. Our resolutions? Keep doing it better. Keep growing and learning and continue to strive to bring great plant stock for our customers. Keep figuring how to do a better display, make great info signs, inform and entertain our customers; keep listening for new ideas and finding new products; keep enjoying being a part of a great market family and helping one another. Strive to have a fulfilling personal life in the midst of a 24/7 farming business. Keep cherishing moments. And always, always, being very thankful for people that continue to support us in the life we have chosen. So, let's begin! Let's rock out New Years and begin anew. Hope to see you this Saturday ! 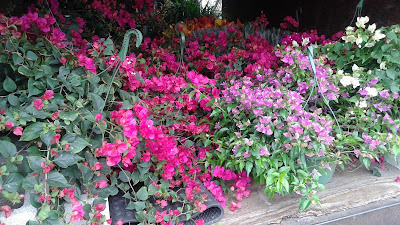 HUGE bougainvillea baskets at Market this weekend !